Popular over all of India, pooris are ideal to cook for small dinners, parties or even festivals with hundreds of guests. On a number of occasions, I’ve cooked 500 or more pooris in a few hours for big feasts. Once you get the rhythm down, it’s effortless and rewarding. 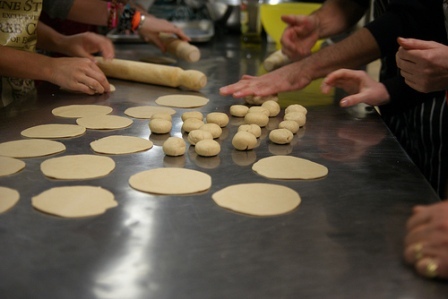 Pooris are traditionally made with straight wholemeal flour, but you can vary the ingredients. One-half chapati flour or atta, and one-half unbleached plain flour makes lighter breads. If you’re expert at rolling, try using just plain flour for translucent, gossamer-thin pooris. You can add yeast to your pooris for light, bread-like results, or add spices to your dough; you can sprinkle sugar on top of pooris for a sweet snack, or you can stuff them with various sweet and savoury fillings. Pooris are traditionally eaten hot, straight out of the ghee or oil, and are even great served at room temperature for picnics or snacks when travelling. Makes about 16 pooris. Combine the flour and salt in a mixing bowl. Rub in the butter or ghee until the mixture resembles a coarse meal. Add up to 2/3 cup of water, slowly pouring in just enough to form a medium-soft kneadable dough. 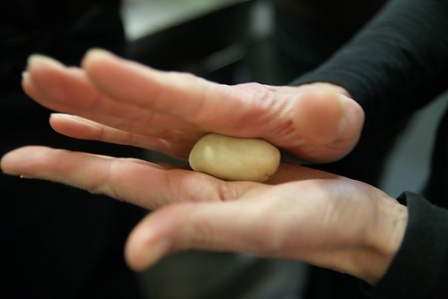 Turn the dough onto a clean working surface and knead for 5 – 8 minutes or until silky smooth. Cover with an overturned bowl and leave for – 3 hours. Knead the dough again for 1 minute. Divide the dough into 16 portions, roll them into smooth balls, and cover them with a damp cloth. 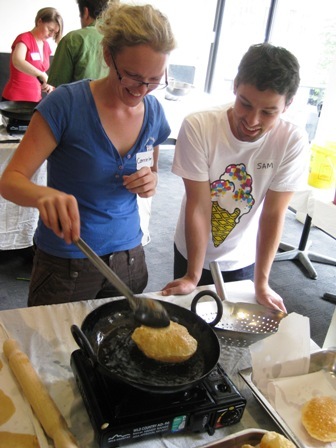 Preheat the ghee or oil in a wok or deep pan over low heat. Roll all the balls of dough into smooth disks about 11 – 12 cm wide with a rolling pin. Increase the ghee or oil temperature until it reaches about 185C/365F. 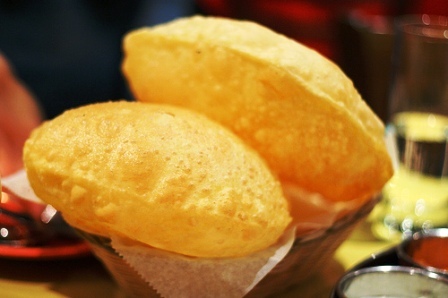 Lift up a rolled poori and slip it into the hot oil, making sure it doesn’t fold over. It will sink to the bottom then immediately rise to the surface. Hold it under the surface with a slotted spoon until it puffs up into a balloon. After a few seconds, when it is browned to a light-golden colour, turn it over and cook the other side to an even golden colour. Lift out the poori with the slotted spoon and carefully drain it in a large colander. Repeat for all the pooris. Serve immediately, if possible, or leave in a preheated, slightly warm oven for up to 2 hours.